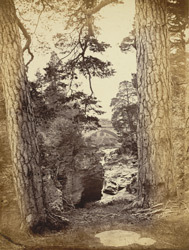 "The Linn of Dee is seven miles from Braemar, and three beyond Corrymulzie. It is not the height of the Fall, but the contraction of the stream, that is the object of interest. The water has worn for itself a narrow passage through the rock. When it is not swollen, there is sometimes a rush of very clear water through a narrow aperture, then a dark pool of considerable depth. In some of these pools, when the water rushes into them with great violence, the ascending air-bells give it the appearance of effervescing. The visitor may descend to the river's edge, and look upon the furious mass of waters crushed together by its stone walls, and raving in its fury; but it is scarcely possible to resist the fear that the wild element may leap from its prison and overwhelm those gazing on its agony."